For the last few posts, I have been teasing you about some freaky bird-chicken-hawk-foghorn-leghorn-falcony-owl thing that Keith has been watching in the backyard and a philosphical discussion about what actually defines “edible”. Well, get up off those pins and needles you’ve been sitting on, here we go. A few weeks ago, my main squeeze, the love of my life, (and my personal chef! Bless him. I requested Beef Stroganoff tonight. Guess what smells SOOO good as I type this? Yup. You may begin your jealousy…NOW) saw a large bird in the backyard, behind the gardens, sort of hanging out in the brush (or is it “scrub”? You know. There.) Here’s a reenactment of the conversation that occurred when he showed me the picture. Him: What do you think it is? Me: That’s a falcon I think. Him: I think it could be an owl. Me: I don’t know. Zoom in. Nah, that’s a hawk or a falcon or something. Look at the tail. Can you zoom in some more? Him: Look at the face, that looks like an owl. Me: It’s a ChickenHawk. Boy, I say, Boy. That’s a ChickenHawk (in my best Foghorn Leghorn). Him: Maybe it is a hawk. See that beak? Him: (Searching the web and ignoring me. Shows me a picture.) Well, this one looks like it, but the tail’s not right. Me: That’s what I’ve been – I say, that’s what I’ve been telling you, boy! Him: I found it. This is definitely it. It’s a Cooper’s Hawk. Check it out. 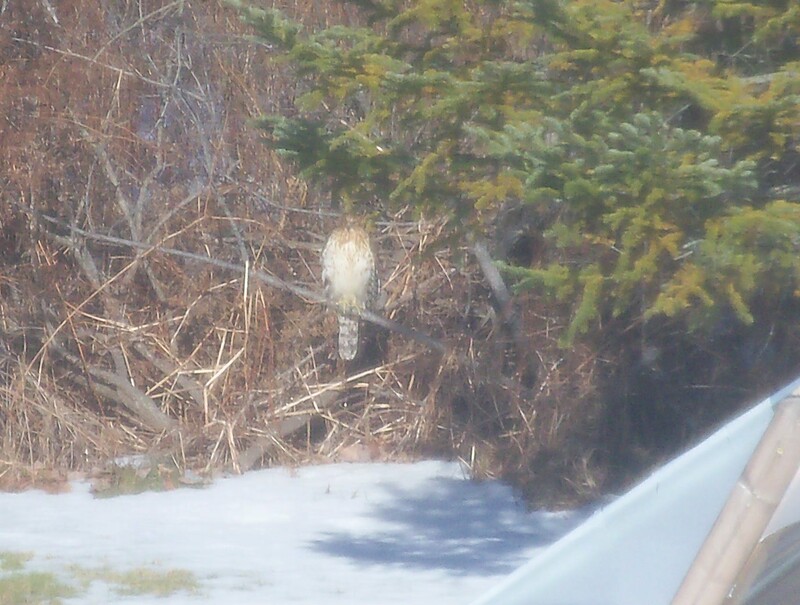 It’s got the face of an owl, but that beak and tail like what was in the back yard. Me: (Noting that my antics were just not getting any attention, decided to give up on immitating Foghorn Leghorn.) (Ok, it was because, quite frankly, I couldn’t remember any more quotes and I had said, ‘Boy, I say, Boy’ so many times, I was irritating myself.) Think he’s eating the moles out there?